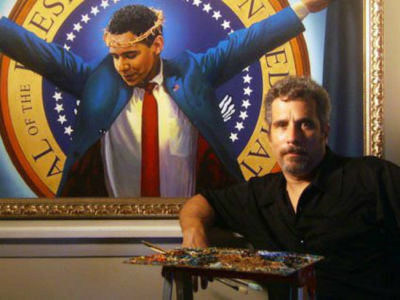 An artist whose depiction of President Barack Obama wearing a crown of thorns and standing in a crucifixion pose was kept from public display four years ago is finally sharing his painting with the public at a college gallery in Boston – although anger remains over the work that some have deemed blasphemous. "I always regretted cancelling my exhibit in New York because I feel my First Amendment rights should override someone's hurt feelings. We should celebrate the fact that we live in a country where we are given the freedom to express ourselves," Michael D'Antuono told Fox News. The acrylic painting, titled "The Truth", was originally slated for display in New York City's Union Square in 2009, but outcry from Christian groups forced a change of plans. Now, D'Antuono's painting is on display at the Bunker Hill Community College Art Gallery in Boston, Mass., as part of a display called "Artists on the Stump The Road to the White House 2012". The exhibit remains open through Dec. 15. Despite it being four years later, however, the controversial painting remains offensive to many Christians. "Disgusting," said Barbara Carpenter in the comments section on D'Antuono's Facebook page where the artist recently shared an image of the painting. "You must be an atheist. I cannot imagine anyone else mocking Jesus Christ in this manner." Crystal Boudreaux Miller made a similar comment, writing, "This is sick and very disturbing! One day you'll have to give an account for your blasphemous depiction of our Savior Jesus Christ! ... Obama has never been treated even close to how Jesus was treated." 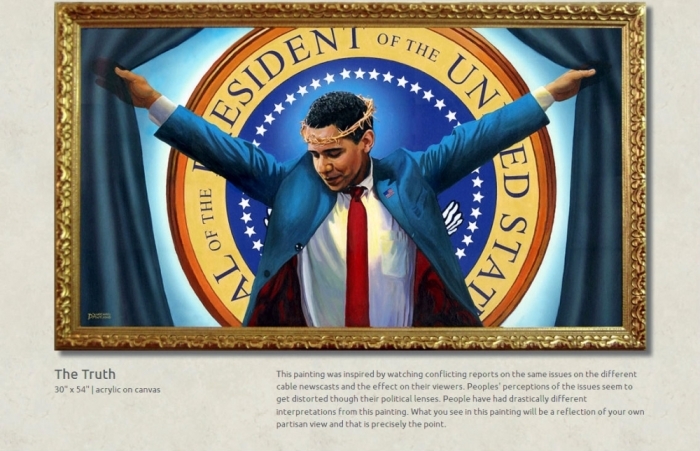 "The painting enigmatically depicts President Barack Obama in the pose of Jesus Christ on the cross, complete with crown of thorns while his outstretched hands appear to pull back the dark veils covering the Presidential Seal," D'Antuono says of "The Truth" in a press release, in which he also describes how "the religious right's extreme outrage" at his use of religious symbolism forced his hand in April 2009. "Interpreting the political piece as blasphemy, they planned protests and wrote thousands of letters demanding the show be canceled," he has shared, revealing that concern among his family moved him to cancel the show. As news spread Tuesday of D'Antuono's work finally being shown publicly, former presidential hopeful Herman Cain caught wind of it and linked the artwork to Hollywood actor Jamie Foxx's recent description of President Obama as "our lord and savior." "Yesterday we had Jamie Foxx saying that Obama was our 'lord and savior'. Today we have the picture to prove it," Cain tweeted to his 220,000-plus Twitter followers. 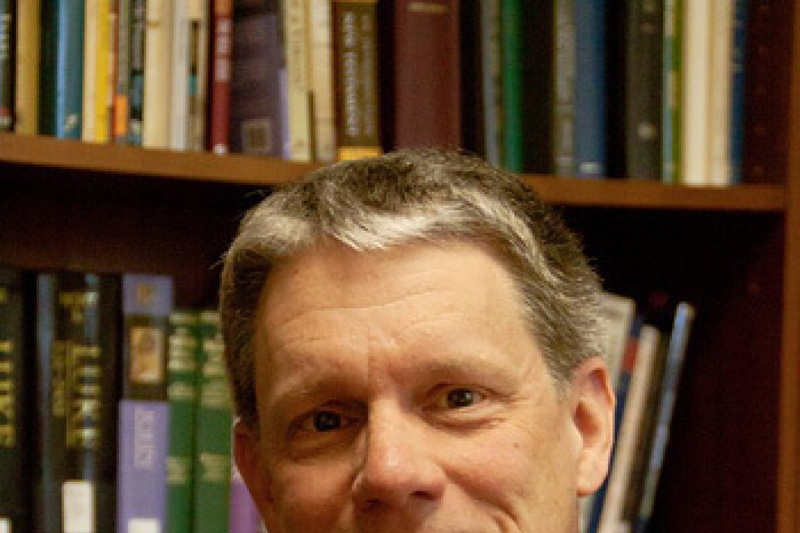 D'Antuono, however, has pushed back at suggestions that Obama's supporters actually believe him to be a "savior" and explained that "The Truth" is not a comparison of the president to Jesus Christ. Fox News reported that the NYC artist "blamed the controversy on conservative media 'trying to promote the idea that liberals believe the president to literally be our savior.'" The Bunker Hill Community College Art Gallery in Boston told Fox News that it has not received any complaints over "The Truth" display at the exhibit, which will remain open through Dec. 15. D'Antuono, whose work offers political and social commentary, says his paintings "[shed] light on greed and hypocrisy" and "challenges people to think more deeply about serious issues and inspire them to improve socio-political conditions."